Content Screening: Dealing with grief. Recommended to: Readers who enjoy rich contemporaries that perfectly depict dealing with grief. I must admit that I've never read Love and Other Unknown Variables, despite much love being heaped upon it by many a reader that I trust. 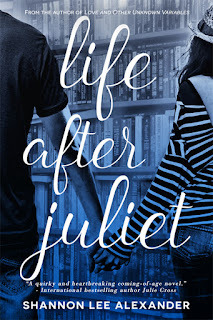 When Life After Juliet was offered to me for review, and I realized that Shannon Lee Alexander had written this as a companion novel, I couldn't wait to dive in! I figured it would be a great way to get to know these characters, and to see if I'd be interested in learning more about Charlotte. The outcome? Someone get me Alexander's other book, stat. I'm hooked, and I don't care who knows it. One of the things that I love most about Contemporary novels is that the characters have to deal with real world problems. I feel like it makes it that much easier to sink into their lives as I'm reading. In the case of Becca, I fell hard for her character the moment I met her. Watching her hide behind her books, favoring the people and places in books instead of the outside world, I totally understood where she was coming from. In books, people are always there. You can flip a few pages back, and make everything better again. You can skip the sad endings. In life, that's unfortunately not the case. Becca's anxiety over losing what's left of her best friend, her unwillingness to deal with the unknown, I felt it all and it broke me. What's beautiful about Life After Juliet though is the message. Becca learns, through a ton of lessons she'd never expected to face, that moving forward is the only thing you can do. Sure, she stumbles a lot. She wavers. She even tries to give up. Except she doesn't, and her growth is just a wonderful thing. I laughed with her. Cried with her. Felt my heart rip out of my chest when she confessed to being afraid to let anyone else in. By far, my favorite part of this whole book though was her relationship with Max. No spoilers here, but this was the most honest relationship I've seen in a book in a long time. Be still, my heart. 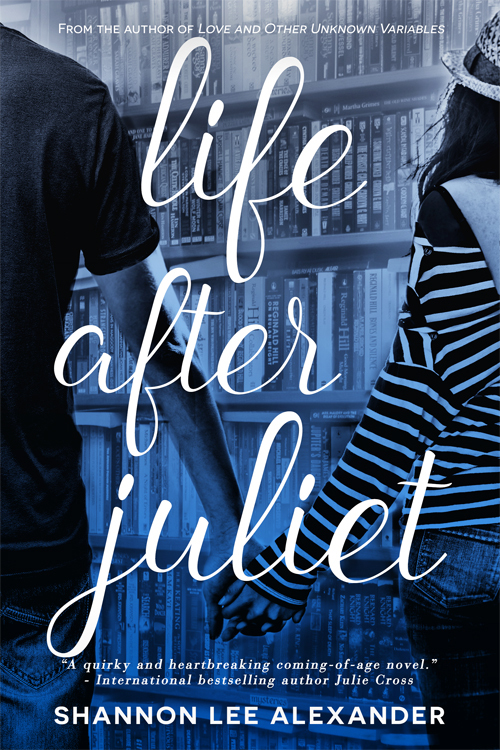 I don't hand out five star ratings easily, but Life After Juliet can't be rated any other way. This book was gorgeous! It was raw, gritty, and the perfect glimpse into the life of someone who is just trying to make the pieces fit together after a big part of them was ripped away. I can't wait to get a copy of Alexander's first book, and meet Charlotte. With how much Becca loves her, I know that I will too.